I saw the Duane Reade story below and decided to call the overall head office of the parent company, WalGreen. I called the Greg Wason, the President’s office at 847.914.2500 and left a message with his assistant, asking him to review the case of the woman being fired. I know Duane Reade says she quit, but when one is forced to quit, it is tantamount to being fired. NY: MUSLIM SUES DUANE READE OVER HIJAB FIRING – A former Duane Reade employee on Long Island says she was fired when she started wearing a hijab, a traditional Muslim head covering, a lawsuit charges.Hira Iqbal, 21, claims that boss Errol Smith told her store policy “does not allow people like that” to wear such clothes at work, claims the federal First Amendment lawsuit, filed in Central Islip.A spokesperson for Duane Reade said Iqbal quit and was not fired. The Walgreen HQ Office took my message and also gave me the name and number for Gale Demico, the Duane Reade assistant to the President Joe Magnacca and left a message there for them to look into this case because we Muslims feel it was clearly a case of not permitting Muslim-garb for an employee. Today, I received a call back from DR Customer Service manager Tonya Ward (212.356.5276) who said she would ask H-R to look into this matter but, because of federal and state privacy laws, I would not be informed as to the resolution of this case; I imagine CAIR will let us know. Ms. Ward cited HIPAA Laws, but I don’t think HIPAA applies because those relate to health insurance. The point here is that a single person CAN have an effect on a potentially growing situation and a single person CAN help stop bigotry….but a group working together, can definitely stop bigotry before it even gets beyond the thinking stage. Make the calls, push the case. We have to tackle the anti-Islam, anti-Muslim movements that are spreading like a cancer through Body-America. To be successful, we MUST keep in mind that we CAN make it impossible for hostile sentiments to take root, but only if Muslims stand together and then work with others of good will. 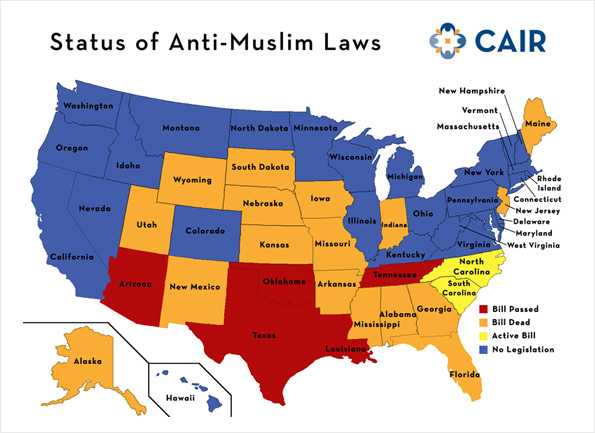 Yarushalmi’s efforts have managed to get 23 states involved in anti-Muslim legislation. True 17 of the states have killed the legislation (for now! ), but even the fact that it got that far, should send chills up the spines of anyone of good will. All, thanks to the efforts of David Yarushalmi and his organization Society of Americans for National Existence (SANE).Yarushalmi has advocated laws that would make it a felony, punishable for 17 years in jail, for a Muslim to support Sharia-compliant Laws (by first defining “Sharia” as calling for violent Jihad against the West). We Muslims only have to unite in collective action to protect ourselves against bigotry, even if we don’t get along with each other as sects. We have to take actions as individuals and as groups and then inshaAllah, we WILL be successful. What will we say when God asks us the same question? That we were too busy fighting other Muslims and most of our spare time was spent in prayer? Quran 13:11 informs us that God will change nothing unless the people decide to make the change themselves (prayer alone, is not worth the hot air we use for it).